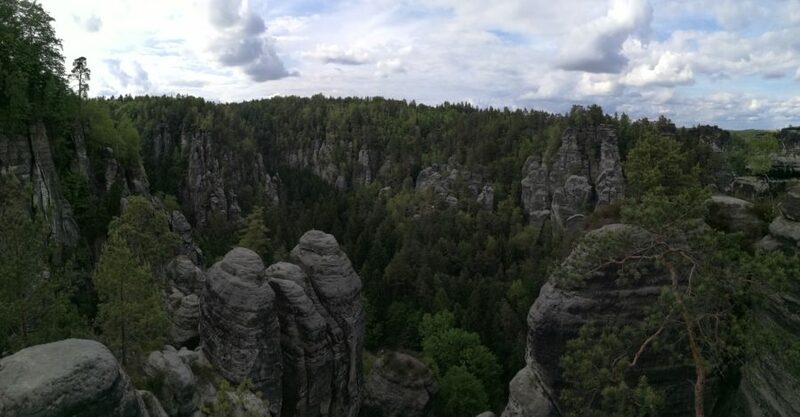 The rock formation of Bastei is located in the Saxon Switzerland Park in the eastern part of Germany. 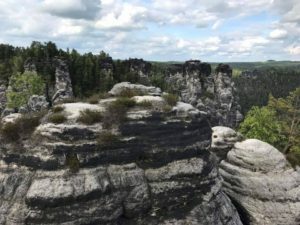 It is located near the Czech Republic border a few kilometers underneath Dresden. The rock formation is right next to the river Elbe and is 194 meters high. The entrance to the bridge is free. There are a lot of hiking grounds you can do throughout the park. To check out for more information check the English version of the website here. The welcome sign underneath shows all the information you need to know before going inside the park. They have one in several languages, including English :). Once you go up towards the restaurant you have an amazing panorama view over the river Elbe. The view as you can see in the picture below is amazing. And it is not even the best sight to see yet! Once you take the stairs down, go to the path of the left for a great view over the Bastei bridge. Walk all the way towards the end of the path and you can go up a viewing point to see the view from the picture below. Also an amazing view over the entire rock formations. After that walk back towards the bridge. The bridge has been a touristic attraction since the 1800’s. And the view from the bridge is not bad either. Walking through huge rocks from an antique bridge, how more charming can it get? And who would not appreciate this view on a lovely day? The sight is worth a visit. There is a paid path which is also worth a visit a bit further if you have the time. Bastei is an amazing sight. If you are traveling through Germany towards either Czech Republic or Poland it is worth a stop! These pictures are so beautiful. The pointed rock formations remind me of the Needles in South Dakota, and the rocks in the path remind me of Rock City in Chattanooga, Tennessee!